Below is a story of a woman who performed 100 burpees each day for an entire year. The hard work performed by this 40 year old mother is not only inspiring, but also led to an impressive transformation. You can see the before and after pictures within the video that follows. There is a side by side comparison at approximately the 4:55 mark. I first shared this story on Facebook after seeing it on my news feed. Upon sharing the video, I was surprised to hear from both of the individuals seen within (see here). I was honored to learn that they are past customers of mine who were influenced by material. More importantly however, I was happy to see yet another low-tech exercise routine that produced amazing results. The exercises performed by Nikki could be done almost anywhere. Her transformation is the direct result of hard work and consistency. She didn’t need anything fancy to completely overhaul her life. Nikki also stated that she would occasionally test herself with 100 burpees for time. Her best performance was 6 minutes and 30 seconds. That’s a solid time for anyone. Performing 100 burpees continuously is no small task. Nikki also performed burpees in conjunction with other exercises and drills. She was quite creative in varying her work throughout the year. Although she may have been performing the same exercise, she was able to prevent boredom through her varied approach. Clearly, the samples above are just a few of the many routines that Nikki performed. Her creative approach to performing burpees minimized the chance of staleness and mental fatigue. Yet, despite her emphasis on burpees, my eyes look beyond the fact that she performed the same exercise each day. No single movement is as important as consistency and commitment. While burpees were an important part of Nikki’s routine, the fact that she was accountable for a certain amount of work each day is what ultimately triggered her success. Nikki woke up each day knowing that there was work to be done and she held herself accountable for it. And if she missed a session, she would make up for it the next day. That alone is incentive to get the work done now, rather than procrastinating. Therefore, Nikki wasn’t just consistent, she was focused on the present. She didn’t worry about tomorrow when there was still work to be done today. Unfortunately, that type of commitment is rarely highlighted by the fitness industry. Many of the big players in the game ignore those intangibles that cannot be packaged and sold. It will always be more lucrative to sell equipment, memberships, and supplements. If you browse throughout this blog’s history, you will see countless weight loss stories that share little in common. For example, there was a man who lost over 100 pounds through running alone. Another man lost over 200 pounds by riding a bike. Others have lost weight through calisthenics and weight lifting. Each story highlights an entirely different approach to training. What these stories share however is that each individual chose to remain consistent. No longer were there periods of inactivity. Finally, each person committed themselves to waking up each day ready and willing to work. The cumulative effect of such hard work and consistency is what ultimately leads to success. What you choose to do is of lesser importance than your willingness to keep at whatever you do as the days and weeks amass. In summary, I am not sharing this story to suggest that everyone should perform burpees each day. Instead, look past the specifics and focus on what is truly important. Nikki is a tremendous example of hard work and consistency. Her willingness to repeatedly hold herself accountable is something that we can all benefit from in some way. Hopefully her example will inspire others to make similar changes if they have failed in previous attempts. Ross, indeed consistency is among the top keys to success. However, how do you factor recovery into the above? True progress in fitness and health is the right amounts of stress and recovery and these are what bring about progress. For the average person 100 burpees a day (or any moderate to high intensity exercise) would result in overtraining or injury. I think activity daily is key but varying intensities between strength training / walking / agility is what brings about lifelong progress. Interested to read your thoughts on this. Uh, no. 100 burpees a day would not be overtraining unless you were seriously 600 pounds or otherwise disabled. Read the post. She started slow by breaking the set up into tens before during and after workouts in the day. Burpees are not impossible by any means if you break them up all day long. A set of ten pullups are impossible for many. Do ten single pullups spread out over the day. Much more doable. Please don’t whine. She did a great job. It is not for weak people though. Most people have the body to do this, but few have the willpower and attitude to stick with it. we are a month into our 100 burpee/day 100 day challenge. one of our all time favorite conditioning exercises. What happens when you hook up a 12 horsepower load to a 10 horsepower machine? It breaks. What happens when you hook up a 12 horsepower load to a human capable of putting out 10 horsepower? The human becomes capable of putting out 12 horsepower over time. What a great blog post! And you hit the nail on the head! It’s about the willingness to do work! Nikki is my wife and we choose burpees because they are as intense as you can get and full body. We thought if you could put your body through this kind of intensity everyday, then that intensity then becomes normal. And anything less than that seems easy. A normal 100 burpee day for Nikki, is probably a “workout of a lifetime” for some. And it was for her too, at the beginning. And she kept going, and going, and going. Now a 100 burpee is a “mini workout” that she does on top of her regular workout. To some (most) 100 burpees seems extreme and might be too much. But remember, Nikki is an average person (look at the before picture). She did it for herself and it was hard and there was hardly any rest or recovery. If she did rest, she had to make up for it. But her body adapted to the demand and changed. A boxer or a wrestler conditions themselves daily, not taking every other day off and they are in great shape. Conditioning can be done daily! It doesn’t have to be 100 burpees a day, it can be anything. People have no idea of their capabilities! It at first took Nikki 45 minutes to do 100 burpees, now it takes her under 7 minutes. She did it quietly, she a lot of times did it alone, and most of all…she did for herself. I noticed she would do ten sets of ten reps at first. One could even spread out the burpees for twenty sets of five throughout the day if they weren’t in good shape. Pavel Tsatsouline called this “greasing the groove,” by performing a given exercise throughout the day but only perform each set at about 50% or so of your max reps. This can work on bodyweight exercise or even weight training. Bulgarian weightlifters have multiple daily training sessions that last between 30-45 minutes each. I read of a powerlifter who used this method with the bench press. He made great improvements and was bench pressing 5-6 days a week. Think I will try the 100 burpee a day challenge. Great idea. Trying to get my wife to do this with me now! Great post. Nikki is not afraid of consistent hard work and it shows. Thanx for this Ross. Feeling slow today. Gotta get my rear in gear. This did the trick. Off to the garage. My ab wheel is taunting me! Just got it and am learning how to use it. Used your tutorial. You are a good teacher. Hi everyone! If anyone is thinking about doing this challenge we have a Facebook page for it. 10,000 Burpee Challenge Davis Training Bootcamp. You can get ideas and support and share how you are getting them done. Also it is a great way to be held accountable. Who is up for the challenge? This really is an awesome story. I love the transformation. And of course her dedication. Motivates me to do something similar. Thanks for the post. This sentence really hits home for me because it is so true. If we apply this principle through the lens of the 80/20 rule, I would say that 80% of the challenge when someone wants to make a transformation is staying consistent. And 20% is their workout or what they choose to do. the women that i have been working out with for the past 2 1/2 years started out being unable to perform even 5 decent top of picnic table pushups with the feet on the ground and hands on the table top, she could not swing a 20 lb kettlebell 20 reps or last thru a 15-20 minute entry level workout. her spirit is amazing and after 2 years or so has lost over 150 lbs. can swing a 40 -50lb. kettlebell for 100 continuous reps and finished the 10,000 kb challenge with a time under 18 minutes for 500 swings with ex thrown in. she has walked the 13.1 mile marathon twice in two years and bested her time ,in addition she participated in a stair climb of 40 flights and finished in a respectable 11 minutes and some change!! she routinely drags over 500 pounds in doors on the sled and just posted a video on facebook of a 600 lb pull!! all this at over 50plus years of age with no previous exercise history ..just inactivity!! she has truly made an amazing change!!!! Consistency is the key to any goal fitness or otherwise. Hi Nikki and Sean Davis! I’m inspired by your accomplishments and dedication. 7 days ago I started the 100 burpees challenge. Truly a tough workout and a challenge itself. It’s been going great and it’s propelled me to jump into the 100 day challenge. So far i’ve been doing 10 sets of 10 and in between each set i do 15 decline push ups to push the intensity. In my profession as a firefighter core strength, cardio, endurance, and a (big heart) is key. 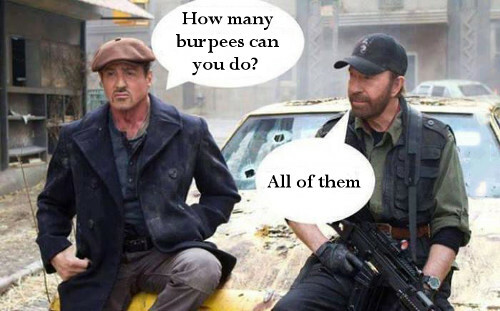 Burpees, being the fact it attacks all muscle groups is a perfect workout for firefighters, police, military, first responders, teachers, doctors, and etc… lol. My best time yet on day 5 was 22:39. Hoping I can stick with this for a 100 days and who knows I might even try a year ;). Thanks for sharing your story because it truly inspired me to challenge myself daily. I completed the year long 100 burpee a day challenge on October 20, 2015. Sadly I did not have much extrinsic encouragement because my friends are tired of hearing about burpees. My body changed dramatically over the last year, along with my physical strength, but more than anything, my resilience, or mental toughness, was the biggest reward. I kind of sensed that would happen going into the challenge because I knew it would be much more of a mental challenge than a physical challenge. Now to knock off 100 burpees is a piece of cake, and I know I can handle anything in life because I am strong both inside and out. Thanks for sharing your story! It’s awesome to hear that you’ve benefited from the example. K. Im a runner have been doing it for 3 years now. And BURPEES have played a big part of my journey. Starting little over weight and always down in the dumps with 3 amazing childeren I managed to loose the weight I wanted. Now to make a challenge and make a stronger me inside and out. What a inspiration! I would like to start this amazing, fun adventure …100 burpees a day for a year.